When I woke up from my night shift on Wednesday I discovered the postman had been and delivered my ugly bug plans sub box. I had ordered the box in November as a spur of the moment after a rubbish day, so it was a lovely surprise. 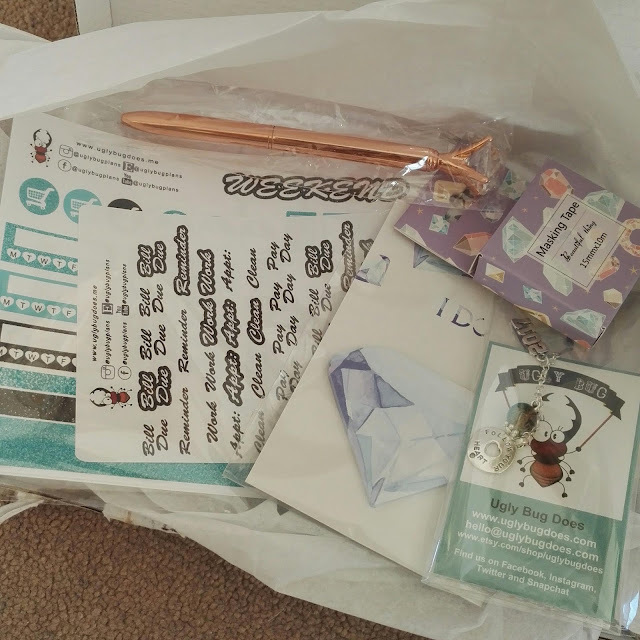 The box contained some gem themed washi tape, a rose gold (trendy) gem pen, gem sticky notes, a 2017 planner charm and 4 sheets of planner stickers in a sparkly effect. All this for £15 including first class postage! I was very impressed and can't wait for a spare few minutes so I can actually use the bits. I can't wait to get another box.